We spend a lot of time helping our users and their businesses grow with email, events, etc. We write blogs, do webinars and fill our social channels with all the resources we can for them. Sometimes, we need to step back and appreciate just what you can do with email marketing. This morning I got one of those reminders from Woodridge Elementary School. 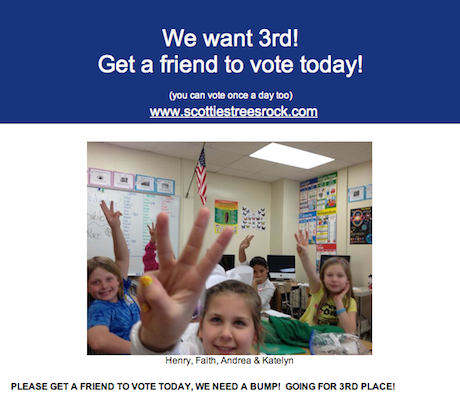 Scotties is running a Trees Rock contest. Students make videos and the finalists are voted upon. One of our users created emails with Benchmark to help promote the contest for their child’s school. 1st prize brings in $10,000 for their school, 2nd and 3rd receive $5,000 and 4th place gets $2,500. How cool is that? We say all the time we’re a champion of small business, but really, we are for all our users. Especially the ones promoting such a great cause. There needs to be more stories like this. I’m sick of hearing about budget cuts! So, let’s help them out! Go to the contest page and vote for McCoy and Mitchell Patterson’s video. They’re currently in 4th place. Let’s get them to the top. Good luck, Woodridge! Are you using Benchmark for good? Let us know! Maybe you’ll be the next one featured here on the Benchmark blog.